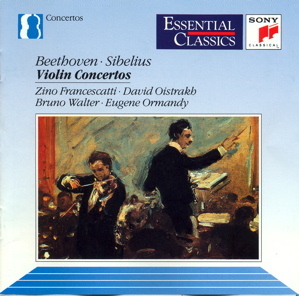 Beethoven composed his one and only violin concerto op. 61 in the year 1806. He was born in 1770 and passed away in 1827. In the years from 1806 to 1807, he had also composed the Symphonies 4 and 5, Piano Concerto No. 4, 'Appassionate' Piano Sonata and the Rasumovsky Series of String quartets. 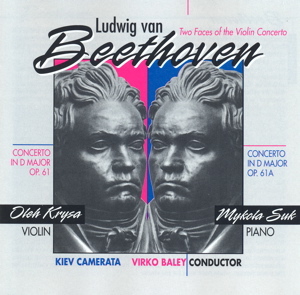 It is widely agreed that Beethoven's Violin Concerto is the greatest of the four great violin concertos. The other three were composed by Brahms, Tchaikovsky and Mendelssohn. Besides Mendelssohn's concerto which was in E minor, coincidentally the rest were all written in the key of D major. Brahms, Tchaikovsky and Beethoven also only composed one violin concerto throughout their lifetime. Like many of the great musical works, this great violin concerto was not well received when it was first performed. These great works were just too forefront, so much so that they could not be understood by the ‘laymen’ in their generation. But fortunately, these great works, like the Beethoven Violin Concerto, were able to stand against time and were finally being accepted by the audience and were being very well received today, and very likely to the very far future. Beethoven Violin Concerto was first preformed by Franz Clement in 1806, but not well received by the audience. 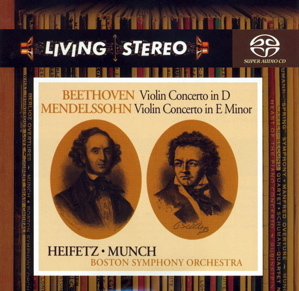 It was in the year 1844, in a performance by violinist Joseph Joachim with Mendelssohn as conductor, this piece of work was then finally became widely accepted by violinists and audience. It was speculated that after Beethoven published the Violin Concerto, he wrote a Piano version of the same piece, probably requested by some of his supporters. I had been hunting the recording of this Piano version, Op. 61a, only to realize that it is the original violin version that becomes well received rather than the Piano version. I do manage to find a 2-CD recording of both the Piano and the Violin version of the Concerto. In these recordings the candaza written by Beethoven himself were used. Beethoven never actually wrote any candeza for the violin, but did write a few candazas for the Piano version of the concerto. His candaza has a section where timpani accompanied the solo piano. The piano candazas were adapted for the violin in this recording. Beethoven Violin Concerto was written in a classical three-movement form. The first movement is a structurally complicated, not so fast in pace Allegro ma non Troppo. The second movement is a sweet, gentle and lyrical Larghetto. The final movement is a dance like Rondo Allegro. During performance there is no break between the second and the third movement. The first movement is grand, long and structurally complicated. This movement is definitely testing the ability of the soloist and the conductor. I always feel that this movement does not actually sounds like a violin concerto. Throughout the movement you have the feeling that the violin is actually accompanying the orchestra. Many beautiful musical themes are all presented by the orchestra. The solo violin seemingly is running scales and appegios, as if the violinist is practicing his skills with the instrument. The composer did give the soloist some beautiful phrases but never for long. Only if you have listened to great violin masters interpreting the violin parts, then you will realize the depth and the meaning behind all these running notes. Just like you are appreciating a glass of wine or a cup of Chinese tea: the more you listen to it the more you will understand the effort the soloist needs to put in to make the notes musical. Also not forgetting the very original beginning of the movement, the four light strokes by the timpani. This is probably the first time a concerto is started this way. And these four wonderful strokes actually form part of the first theme in the first movement, what a genius Beethoven he is! The second movement is calm and soothing. It is a very special feeling when this movement is played by a female violinist. Just like the first movement, the solo violin is just playing a role of bridging the gaps between the musical phrases played by the orchestra. At the end of the second movement, is a very short and lively cadenza, and there we are the music goes into the last energetic and dance-like final movement. To me it is the final movement that finally sounds like a violin concerto. The violin becomes active and proactive, leading the orchestra into a merry celebration. The violin starts by playing the first theme on the G string, and the pace is fast and lively. And quite humourous is the ending: the orchestra is thinning out, finally left the violins section playing notes slurred, and the volume get softer and softer leaving only the solo violin. Just when you thought there are some more stories to tell, the orchestra and the solo violin ended the movement with two loud chords! As mentioned earlier Beethoven himself did not write a cadenza for the solo violin. It is customary at that point of time that the cadenza was left for the soloist to show off his skill. There are few cadenzas for this concerto. One is long and expanding at the end of the first movement, one is short between the second and the third movement, and just before the end of third movement, there is another one. There are many versions of cadenza written for this concerto. The most popular one is the version written by Fritz Kreisler. Kreisler wrote a fantastic cadenza for the end of the first movement with two first movement themes running concurrently on the solo violin using double stoppings. I felt that Kreisler’s cadenza, while allowing the soloist to show off skills, also gels very nicely with the original themes. Another popular version was written by Joseph Joachim. Also well written but sounds more masculine when compared to Kreisler version. I have close to 100 versions of this great concerto. 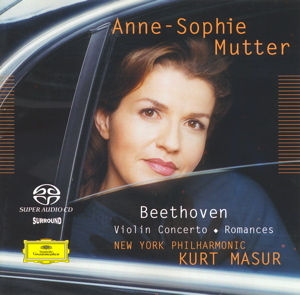 The recent 2002 live recording by Anne-Sophie Mutter (SACD DG 471633-2) is probably the longest. The recording times for the three movements were 27’09, 10’58 and 10’11 respectively. Mutter’s interpretation in this recording was very different from her early recording with Karajan. There are people saying her great exposure to modern classical has affected her way of interpreting the traditional classical. 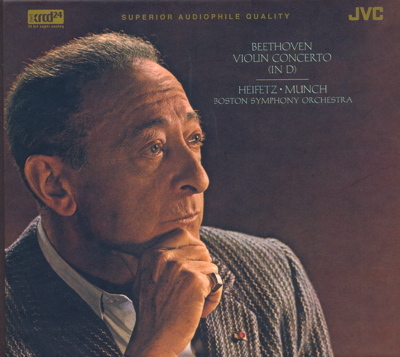 Comparing to Mutter’s Beethoven violin concerto, Heifetz (JM-XR24003) played very fast: 20’33, 8’45 and 8’23 for three movements. The total difference in timing is 12 minutes. 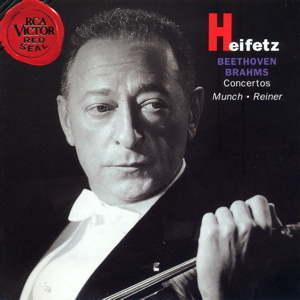 Just the first movement the time difference between Mutter and Heifetz is about 6 minutes. I believe many classical music lovers may not be agreeable to the tempo used by Heifetz for the first movement. But personally I am fine with Heifetz choice of tempo. There are beautiful surprises in Heifetz’s first movement, and these effects can only be achieved with that type of tempo. Mutter used cadenza written by Kreisler, and Heifetz modified those written by Auer and Joachim. 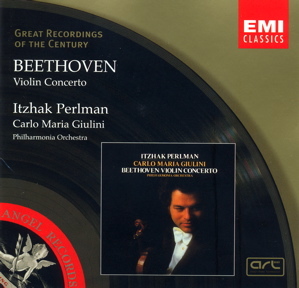 Itzhak Perlman solo violin, Carlo Mana Giulini conducting Philharmonica, cadenza by Kreisler, EMI (7243 566952 21) 1980 recording. 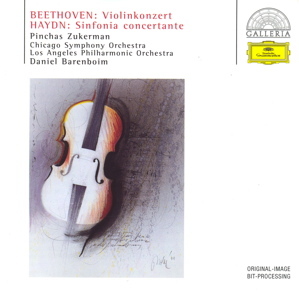 Pinchas Zukerman solo violin, Barenboim conducting Chicago Symphony Orchestra, cadenza by Kreisler, DG (463078-2) 1977 recording. 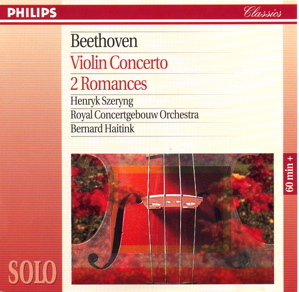 Henrky Szeryng solo violin, Bernard Haitink conducting Royal Concertgebouw Orchestra, cadenza by Joseph Joachim, Philips 442 398-2. Zino Francescatti solo violin, Walter conducting Colombia Symphony Orchestra, cadenza by Kreisler, SONY (SBK 47659) 1961 recording.